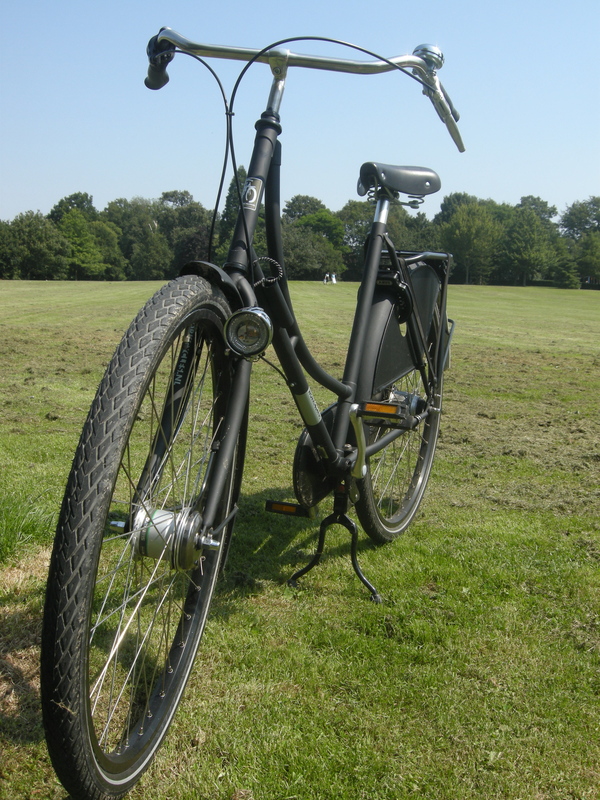 In the UK, the bike shown in the picture above is seen as a ladies’ bike; it has a step-through frame, which is (stereotypically) assumed to accommodate a long, flowing skirt. Even some of my more enlightened bike-riding compatriots have disparagingly referred to my Omafiets as a ‘girls bike’. But the idea that the absence of a top tube is for skirt-wearers is a bit of a myth. The addition of a top tube to a bicycle is for strength. If the bike is strong enough, then there is no need for a top tube, and the bicycle is easier to mount and dismount. Dutch bikes like this Omafiets are strong, with no need for top tubes, and you can hop on and off them much more easily than a ‘standard’ triangular frame. That means they are ridden quite commonly by males, as well as by females. One particular advantage of a bike without a top tube is that the transition between walking and cycling – and vice versa – is very quick and easy. You just step from the bike, instead of having to swing your leg over the rear wheel. Never having ridden a bike like this before, this came as a bit of a revelation. It’s so much simpler to start and stop riding. In fact, simplicity is the essence of this bike. Everything about it is designed to make cycling as painless – both literally and metaphorically – as possible. The riding position is gloriously upright and comfortable; it’s like walking, your legs making slow circles, but of course travelling much faster. The timeless design is a consequence of the Victorians working out precisely the best way to convey oneself is a stately fashion. 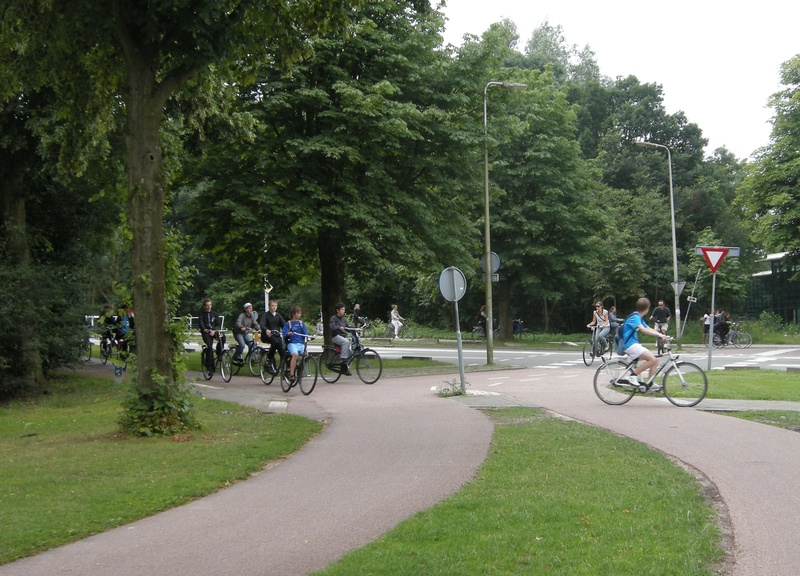 It hasn’t been bettered; that’s why the Dutch still ride bikes with this kind of geometry for their everyday cycling. Ironically, the design of this bike, so traditionally ‘Dutch’, is actually… British. Unlike in the Netherlands, where everyday cycling survived largely intact during the twentieth century, bicycles essentially disappeared from Britain as a mode of transport. The only bicycles left were ridden by the faster and sportier, and as these riders preferred a bicycle that allowed greater speed, that became the British bicycle of choice. It is only recently that ‘upright’, relaxed bicycles have become available again on the British high street, despite the British largely being responsible for its design and evolution. The Omafiets is not a nimble bike. You will not be able to accelerate away from the lights, nor will you be able to go fast up hills, or to swerve around corners; that’s not what it is for. It is for cruising along. Indeed, the experience of riding a bike like this is most analogous to riding a large American classic car, being big, heavy, and with plenty of vehicle out in front of you. It took some adjustment to having around five feet of bicycle out ahead of me, being used, ordinarily, to hunching over the handlebars, my head approximately over the front wheel. But it became natural very quickly. The steering, with the handlebars sloping back towards you, is relaxed and easy – not at all twitchy. It’s easier to interact with other people, too, whether they are in cars, or on foot. You’re meeting them face to face. And the higher position is great for better visibility (you can look over the tops of cars, for instance, even larger ones), and for being seen. which means that your clothes stay grease-free (no need to tuck your trousers away) and also that the elements are kept away from the chain. which changes the hub gear. No working parts exposed to the elements, so (hopefully) very little maintenance required. Top speed in 8th gear is about 15-20 mph, while first gear is definitely for trundling. Despite the massive weight of the Omafiets (probably around 25 kg, at a guess) you can get up steep hills on this bike; you just do it slowly. Gear down, and go at a speed you are comfortable with. That’s it. The weight is indicative of the bomb-proof nature of the bike. Everything is designed to be indestructible, and to last. The mudguards are seriously durable. The tubing supports are nearly as big as the seatstays on a racing bike. At the rear, they carry the cabling for the rear light, and also double as a bumper. The weight is a crucial advantage, in one important respect – you can park the bike up anywhere, without great risk of it being stolen. Use the stable centre kickstand, and take out the key. Just like a car, the bike can’t be ridden if the key isn’t in the ‘ignition’. Realistically, it can’t be carried away – I’m reasonably fit and strong, and struggle to lift it – so it is safe to leave it for short periods, depending on the area. While I definitely wouldn’t leave the bike overnight without locking it to something, shopping is definitely a doddle. Just roll up to the front door of the supermarket, and take the key out. The full carrying capacity of the bike is huge. I’ve never used a shopping trolley to load up a bike before, nor have I made sure to park a bike by my front door for ease of unloading. The Clarijs panniers are massive. 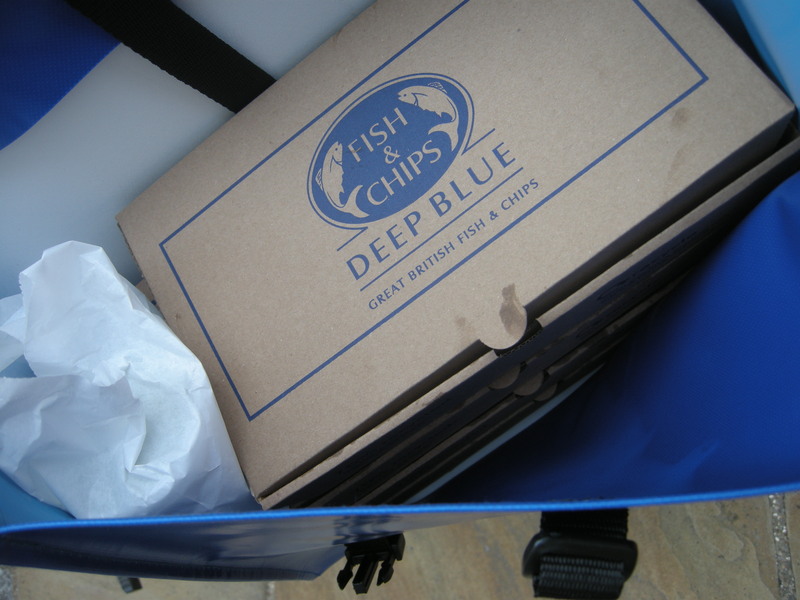 Easily accommodating a fish & chip supper for four, in just one bag, with room to spare. 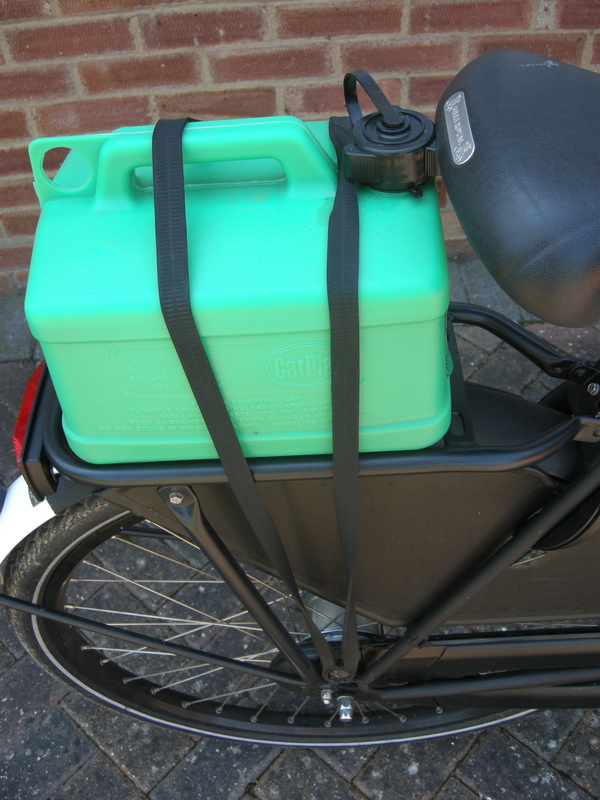 If the panniers aren’t big enough, there’s also a front carrier, capable of carrying 25 kg. It’s really easy to add and remove the carrier – it simply slides in and out of tubes on the frame, an operation that takes seconds. 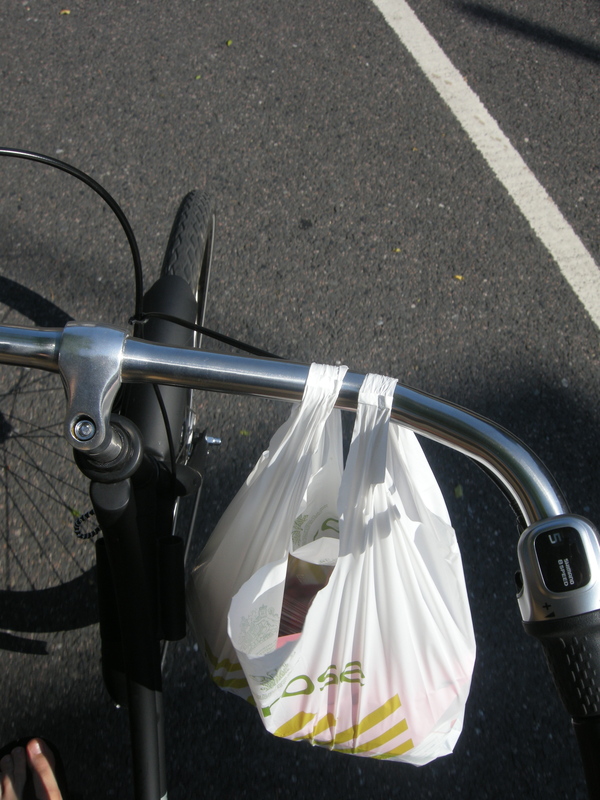 Ordinarily, I wouldn’t dream of dangling things from the handlebars, but the bike is so heavy and stable, it’s not a problem to hang a bag there. 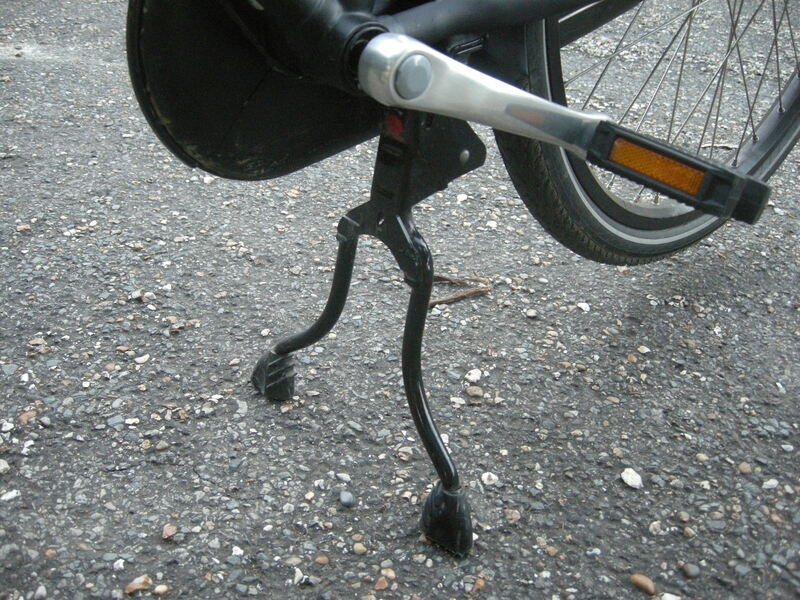 A spring steering stabiliser helps to keep the bike under control, when parked and when being ridden. At the front, there’s a drum brake and dynamo hub, which powers both the front and rear lights. You really don’t notice whether it’s on or off. The only modification I’ve made to the bike is to replace the original Busch & Muller front light with a model with a standlight; I didn’t feel particularly comfortable not having a front light while stationary. Probably acceptable on Dutch roads and cycle paths, not so safe here. My front light is now a Lumotec Classic, with standlight, and the bonus of old-fashioned looks. The intensity dips slightly when the dynamo has stopped, but the light is still bright for around 4-5 minutes after stopping. It’s a great light. The rear light has a standlight too, which lasts even longer. I never have to worry about charging up bike lights, or making sure lights are attached to the bike, or worrying about taking them off. The lights are part of the bike, and they will always work. Yet another way in which this bike is hassle-free. 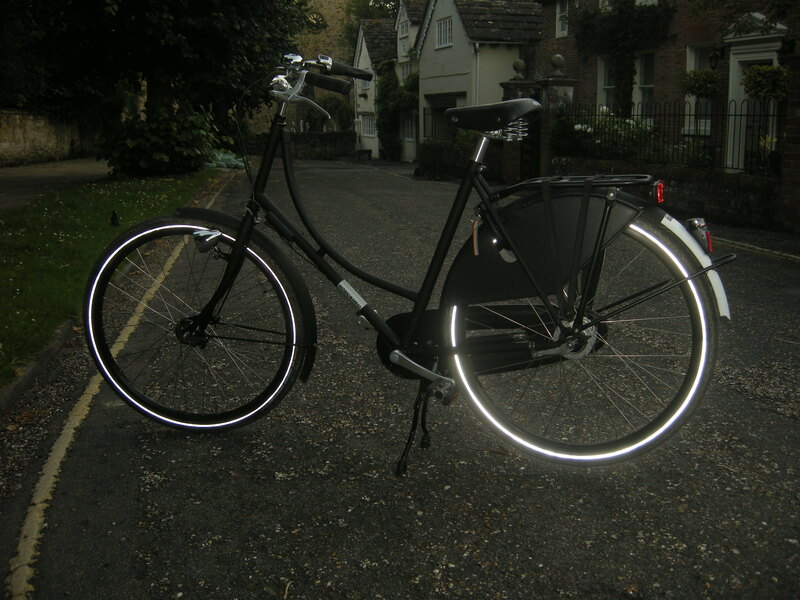 Even without lights, the bike is highly visible, with reflective sidewalls on the tyres, and a double rear reflector (a reflector is also built into the front light). 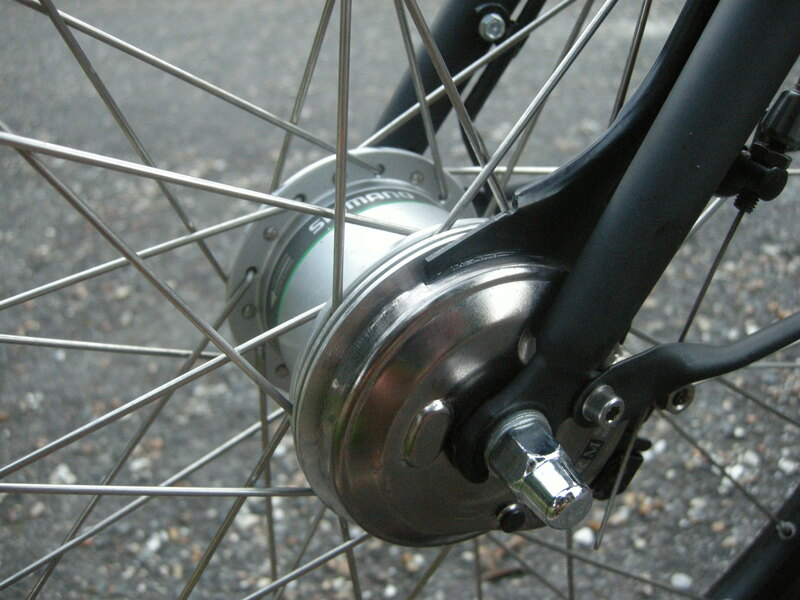 The final element is the rear coaster brake, contained in the rear hub, along with the eight gears. Apply backwards pressure to the pedals, and you slow down. I had been rather nervous about it, but it is completely intuitive, just like using a brake pedal in a car. It’s much more effective than I had expected it to be; with your weight almost entirely over the rear wheel, you can bring yourself to a stop very quickly with just the coaster brake, bringing the weight of your body down on the pedal. The front brake, in my experience, is really there for a bit of ‘extra’ braking; it’s not as powerful as the coaster. The use of a coaster brake probably justifies a post of its own, but it really doesn’t take much getting used to. You just have to stop yourself from idly backpedaling as you cruise along; you will be braking! The Omafiets is not a bike for Olympians; it’s a bike for ‘ordinary’ people. While a pleasure to ride, it really brings home to me some of the difficulties a wider range of people might experience riding bikes in the UK. The slower speed you are inevitably forced to adopt makes the difficult right turns, big junctions and fast roundabouts that little bit more intimidating. The weight of the bike shows you how the elderly – and the less fit and able – might struggle to take their bikes onto a train. (There are only stairs at the eastern entrance of Horsham station, and I haven’t attempted to carry the Omafiets up them. I can think of several other stations in Sussex where I might struggle to get on the platform.) Likewise the size of the bike really emphasises just how badly some of our cycle infrastructure is designed and implemented; tight corners and fiddly gates become especially tight and fiddly on an Omafiets. But all in all it’s been an absolute joy. Riding it is instinctive, comfortable and fun. So simple to use and look after, it’s what a bicycle as a mode of transport should look and feel like. Good article but puzzling over your front light fitment. Putting it where beam can be obscured by tyre is a hazard in itself. If you are forced into this arrangement (by a rack, for instance) then, for the UK, it should be on the right hand fork. Agree with you over frame shape but note that even the Dutch firm Koga put a male and female sign next to the frames they offer. See koga.com. Yes, the light fitting is something I had been worrying about before purchase, particularly the tyre-obscuration issue. Of course, mounted on the right you have similar issues – drivers emerging from side roads on your left will not see a right-mounted light as obviously and easily as they would if it was mounted on the left fork. On either side there will be problems of visibility that would not occur if the light was mounted higher. But in practice (hard to show without a photo) the light is visible at pretty wide angles right up to a distance of a few feet. The head-on night shot near the bottom of the post gives a reasonable impression. I haven’t been too concerned, as yet. I used to work with someone who had one of these and it is a very, very nice piece of kit. If I didn’t already have a similar but different bike I’d definitely consider one. 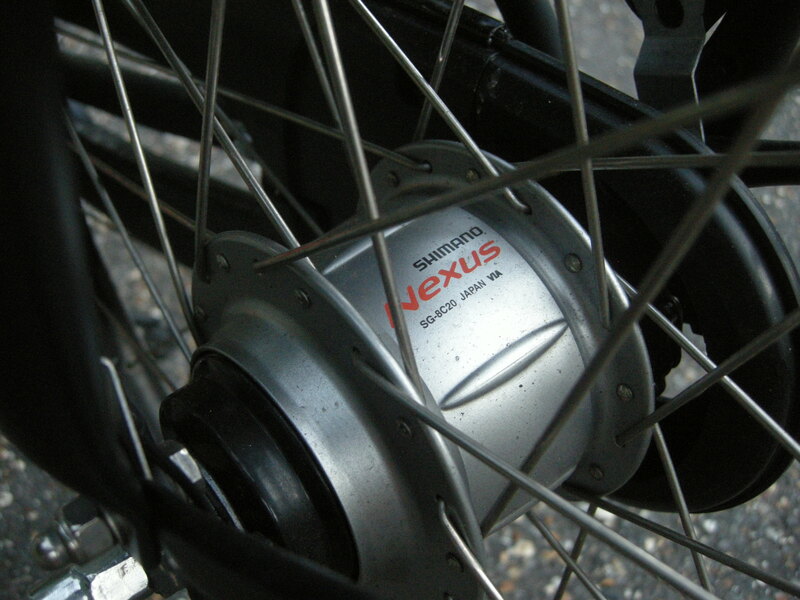 If the front brake is a bit disappointing, it may be because some Shimano front roller brake hubs have a power modulator clutch which is designed to stop people on aggressive geometry bikes (in which these brakes would never realistically be used) from going over the bars when braking hard. Unfortunately, I can’t mount it above the fork crown, because it would foul with the front rack, when installed. The ‘standard’ Workcycles Oma- and Opafiets have the light mounted there, but those with rack fittings have the light mount on the fork. If the issue is oncoming traffic, then there really isn’t much of a problem; the light only becomes obscured at, say, a 45° angle, at a distance of only a few feet, by which time it would be too late to avoid a collision in any case. I might have to do a drawing to show the visibility arc. The front brake has bedded in; it was worryingly weak for the first few weeks, but is now much more reactive. I’m late to the party, as I found this blog when googling my bike for fun. I’ve been riding an Oma for a little over a year now in NYC, with my light in the standard position seen above (I also use a front rack) and I’m highly visible. The light is big and harder than you think to obstruct. Also, the spokes on the front wheel end up being illuminated as well. Yes, it shines through the front wheel pretty well. I certainly haven’t had any problems. Interesting to see that these bikes still have a large white patch on the rear mudguard. Apart from during the world wars, these patches were considered all a bicycle needed for night riding in the UK: the opinion being that cars should be able to see where they are going in the dark, and a white patch was plenty to make a bicycle visible. Rear lights on bicycles were only made compulsory during the world wars, when the restrictions on car headlight beams made it much more difficult for cars to see where they were going. 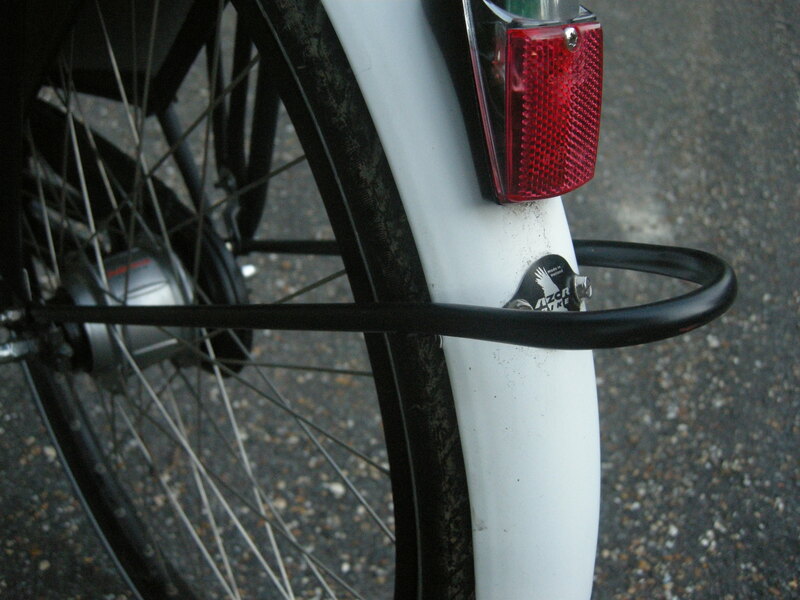 Rear lights for bicycles were only made a legal requirement in peace time following the second world war. Since then cars’ headlights have become dramatically brighter and have extremely good beam patterns. So cars should now be able to see obstructions in their way whether lit or not, and bike lights should logically be as unnecessary as pedestrian lights or dog lights or tree lights. But motorists have been pandered too for decades now, and they no longer have to look where they’re going very much. The arms race of vehicle lighting continues, to the long-term disadvantage of everyone. Yes, the history of the ‘visibility’ of bikes is an interesting one. Reflectors and patches were an accommodation by cyclists, to avoid the addition of rear lights, and as you say it was only the Second World War that brought in compulsory rear lighting. I could be wrong, but I think it is Dutch law that requires the white patch. Certainly reflective tyres are required in the Netherlands. I don’t mind, necessarily, features for visibility that are subtly incorporated into the bike itself, as they cost me nothing in terms of extra effort. Reflective clothing and hi-visibility fabrics are a different matter. I believe the white patch is simply part of the traditional (and functional) look. By the way Dutch lighting regulations are very relaxed: Minimum is a front and back non-blinking LED, powered by batteries, plus the reflectorized tyres, pedals and front/back reflectors. A symptom of this “arms race” is what I call “lux-narcissism”, and I write about it here: http://greenideafactory.blogspot.de/2010/09/dont-believe-hyper-illumination.html (also my most popular post). A research project about the most recent motorized-vehicle lighting efficacy in regards to non-motorized vehicle users would be very interesting, but also many older vehicles have dimmer lighting. Also subjective and objective safety for cycling varies widely, even more beyond Europe (even if in general it is relatively safe.) Also with hundreds of millions of lit-bikes out there, it seems a daunting feat to get people to remove the lights, as – following lux-narcissism philosophy – everyone should have similar intensity lighting when riding in built-up areas (and motor vehicles, too!). 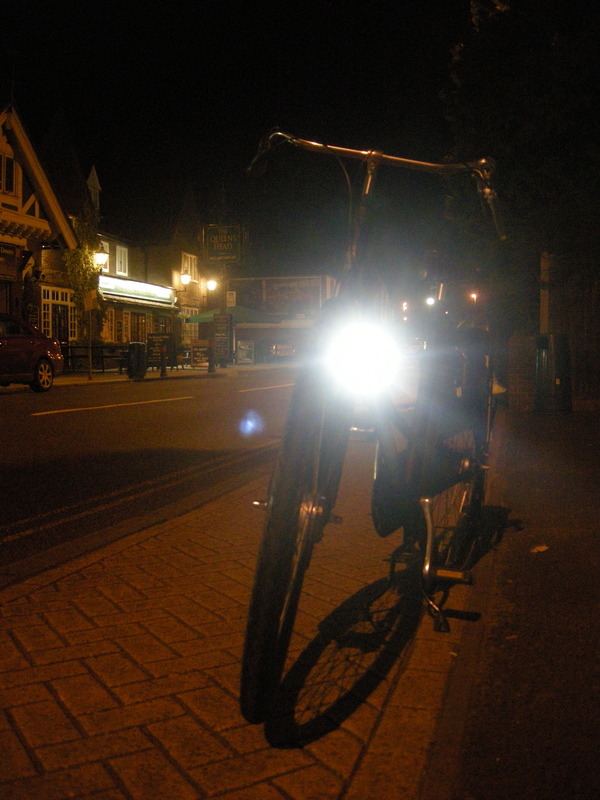 But finally, front lights on bikes are also very useful for both pedestrians and other cyclists (esp. on two-way bike paths). Not as much to see but to be seen. I too am a convert to Dutch-style bikes, although mine has a crossbar. The simplicity of just being able to jump on and ride (no need for trouser clips, finding lights and/or locks) at any time, and in any clothing, makes it so much more useful for local trips than my old touring bike. I think I’ve just fallen in love with this bike. It’s a stately, elegant duchess! Would you mind sharing how much one of these costs? The basic model is 700 euros. You will have to pay more if you want gearing, and extras like the front rack. You don’t necessarily have to get the Oma – Workcycles do other bikes, and often have clearouts. There are also shipping costs, but I have seen Workcycles Omafiets and Opafiets for sale recently at Bikefix on Lamb’s Conduit Street. Might be worth getting in touch with them. 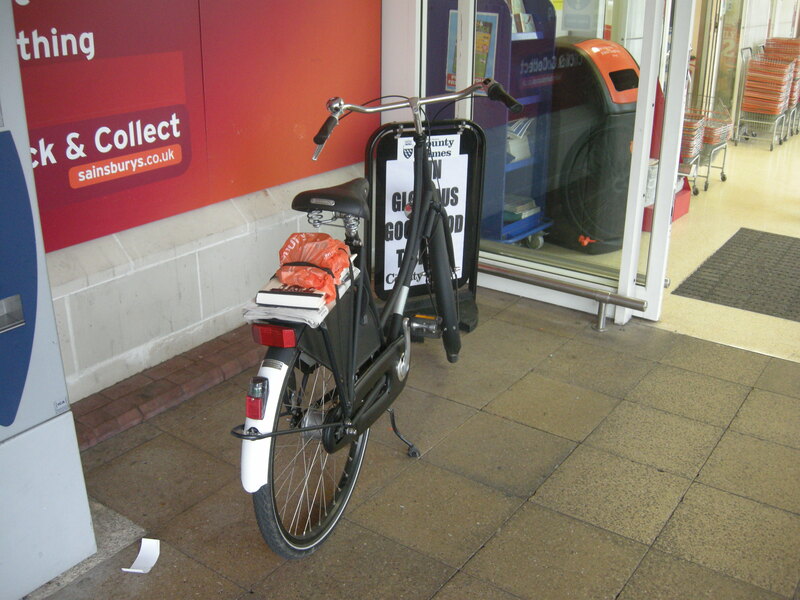 And of course there are other Dutch bikes available in the UK, like Batavus and Gazelle! Indeed. Maybe it’s a deliberate attempt to avoid being seen as advertising, but I’m interested to know a make and model (then I’m sure I could find prices myself). Am I missing something obvious? I rode a bike of this style from a hire place in Copenhagen recently. It had a rear child seat for my daughter and the step-through frame makes getting on and off so much easier when fully loaded, perhaps with a handlebar child seat *and* a rear child seat ( like this: http://www.dutchcitybike.com/2010/11/dutch-bikes-with-child-seats/ ) , or just with full panniers. I think you could have made more of this in the article – maybe child seats aren’t a priority for you! But I like touches like the removable front rack, which is a new one on me. Yes I was missing something obvious and you’ve already answered the question. Oops. And thanks! With an identical second LED front light, coupled with the typical higher cycling speeds cyclists are coerced into by British road conditions, it would probably be possible to run a pair of the B&M Classics in series (with the rear in parallel to them both) from a single bottle dynamo. There are of course other possibilities. Pashley do a range of classic English Roadsters (which is where the “Dutch bike” originates) and the pricing is probably similar, at around £650 for a fully equipped model like the Princess or Britannia. I really have no idea whether they ar still in production, but Dawes used to do a range called the CityVision, which come close, although they don’t have a fully enclosed chain. My wife and I also have a brace of British Eagle Cambridges, aluminium framed, 7 spd Shimano hub, chaincase (over the top and front of the chain), etc. Finally, the Kettler range of alu framed bikes from Germany are worth a look. My wife has one of their City Cruisers. £500 gets you a step-through with Shimano 8spd hub, front dynamo hub, chaincase and skirt guards, front pannier and rear rack, and integrated rear wheel lock. One slight oddity is the wheels – 28 inch with Schmidt (?) valved tubes which you would have to replace through a specialist. All of these also have conventional front and rear handle-bar operated brakes. Dutch bikes seem to favour these back-pedal rear braking arrangements which I imagine must take some getting used to. And for anyone who wants a step-through frame but doesn’t want people to think him a girl, there is always the Brompton. Yes, there are an increasing number of manufacturers (British ones included) that have comfortable bikes available in the UK now. I’ve also seen Fahrrad bikes around, and they look nice. I should add that the Workcycles bikes come with the option of coaster or handle-operated rear brake. You specify the choice. Likewise (I think) most Batavus and Gazelle bikes available in the UK don’t come with a coaster brake. Jim Davis’ Batavus Old Dutch has drum brakes front and rear. Very late into the game I know, but as an owner of both Pashley and Workcycles bikes all I can say is – Workcycles is way ahead of Pashley when it comes to durability and reliability. I’ve good £400 pounds on maintenance of my Pashley Princess over 3 years (the SA 5sp hub is terrible, the forked cracked twice and the bottom bracket gave up not mentioning cables and chains), and in that time I only had to replace the chain on a Workcycles bike. I would not recommend a Pashley to anyone who need a reliable bike to cover big distances daily on UK roads – they look pretty, but they are no match for london roads. You’ll actually save money by buying a more expensive Workcycles. In NL you only legally need one brake. Many have just a Coaster. For our market they may come with a Caliper on the front just for legal reasons. I’ve had a 2nd hand Gazelle Primeur for over 18 months now which like yours is lacking a crossbar. I bought it after finding the crossbar to be a problem on another bike when load lugging or pulling a trailer bike. It wins hands down for safely mounting & dismounting, and strangely enough the riding position lends itself to a bit of mud plugging with superb low speed control…not to mention the huge mudguards keeping you clean! The design may be British in origin but it’s the Dutch who have improved the design with hub braking. The main reason for the sudden popularity of this model among Dutch boys (20 years earlier you wouldn’t want to be seen dead with a girls bike!) is because boys like to do wheelies on their bikes. It’s a lot easier on these omafietsen, and IF it goes wrong, the family juwels are not in serious danger. It’s a fashion thing. I don’t expect you are planning to do some wheelies with it, are you? Woo-hoo! Go on, have a go and can we have some pictures please?! Great review of my very own beloved bike! I’ve had a Workcycles Omafiets for a little over 2 years and it is the most amazing bike I’ve ever owned. Definitely a different ride than on my mountain bike, but so suited for the city. My chain guard looks to be of a different material and shape than yours, and mine came with a Brooks saddle, and front & and rear roller brakes. Same gears though, and fenders and lights. And I too love the front rack. An I know a few men here in Chicago that ride Omafiets and prefer them to Opafiets. The back pedalling type of brake used to be very handy for people carrying things in their hands. For instance, a carpenter would ride to his work carrying his wooden tool box on his shoulder, or, like my grandpa did, ride with heavy wooden beams on one shoulder. Those were different times. The nicest riding bike I ever had was a very old ‘grandpa’ bike that once belonged to my dad. I found it in the attic and restored it. But the ‘grandma’ model rides even better. I am amazed at how low your steer is set, however. Normally the steer is set much higher, so that the rider’s back is absolutely vertical. These bikes are all about enjoying the ride and admiring the countryside, talking to a friend riding alongside, greeting other cyclists with a benign smile and a wave of the hand. Just to make sure: although this type of bike is still enormously popular in the Netherlands, we ride all kinds of bikes over here. But anyone would agree that, as far as comfortable riding is concerned, nothing beats this model, and the Workcycles one looks like one of the very best. Starting to truly admire Workcycles. Will probably consider one in the coming years. For now it’s my Raleigh copy with Dutch upgrades (it even once fooled a Dutchman). I never realized that the Pickup rack mounts appear to be brazed on. Fantastic! I’ve put exponentially more than 25kg on mine. Actually the higher-end Pashley models (the Princess and Roadster Sovereign) do come with a rear wheel lock and kickstand, though not quite as sturdy a kickstand as Workcycles offer. I suspect I saw you pushing this bike past my house this morning (Cricketfield Road) wearing a straw like hat. I suspect you did, unless there are two Workcycles in Horsham! I would have said hello, if I’d known. A great explanation of what makes these bikes so brilliantly fit for purpose. I hired one for a few days on holiday in the Netherlands recently, and had a very amusing conversation with the guy at the hire centre about the locking mechanism. I simply couldn’t get my head around the fact he wasn’t giving me a D-lock or cable, and that this locking brake mechanism would disuade opportunists thieves from making off my with my bike. Hi – I wonder if you wouldn’t mind telling your height and bike size? I am 5’3″ and wondering in the Workcycles Oma 53cm would work for me. Thank you! I am 5ft 10 and I have a 57cm frame, so my guess is you would be alright with a 53. I think frame sizing is quite flexible with an Oma. Do check with Workcycles though – I’m sure they’ll be happy to answer your questions. Great write up Mark. I thought I would follow my own lead and #godutch I didn’t plan to buy the step through frame, but it just makes more sense. I bought an Achille from ‘The Bicycle Man’ on Old Street in June. The slower pace of the ride makes me so happy and get to talk to my 2 year old toddler up front. My set up is very similar to yours, with the wheel lock, nexus hub and dynamo. Looking forward to chilly autumn rides in a long coat! There is a kind of bike-pushing gutter running up the stairs at the rear (east) entrance to Horsham station. I’ve never used it myself but I imagine it would make it possible to get up the stairs without carrying, just a bit of a push. There are also gutters down to (some of?) the platforms. Lovely bike and awesome review. 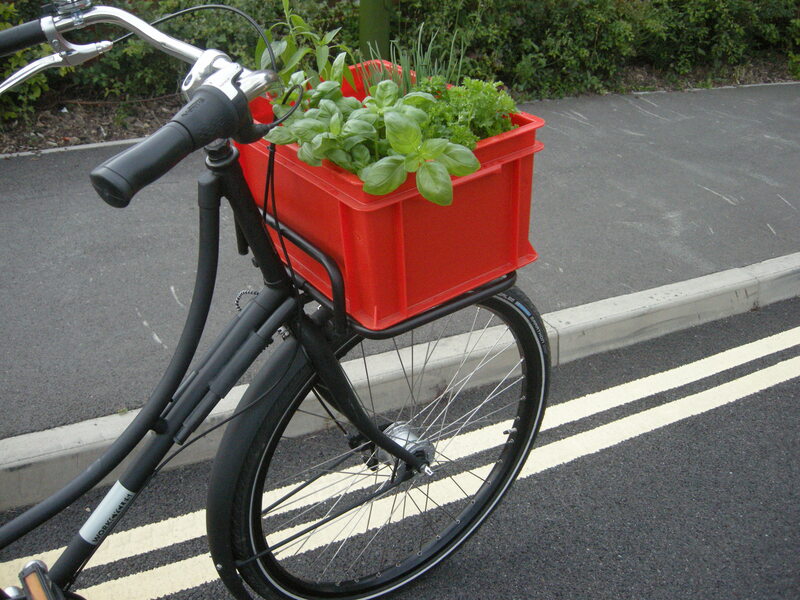 I have ordered a Workcycles GR8 with a front carrier and was wondering where you got your crate and what size it is? The crate came from Workcycles themselves – they have the right sizes in stock. It is, however, just a standard Euronorm crate size, measuring 40X30cm at the base (this will slot in nicely to the carrier). I’ve also dabbled with wooden crates, which are quite easy to attach. Antique shops are a good place to hunt for these. Thanks very much for your reply and you advice, I will check out the local antique shops, bet your bike looks lovely with the wooden crate. I love the Omafiets and was pretty close to ordering this but I just loved the GR8 a wee bit more. Your blog is very interesting, great work. Yes, I was tempted by the GR8/FR8, but I couldn’t really justify it! I’m sure it will be just as lovely a ride as the Omafiets. Hi, are you happy with your workcycles gr8? Cant find many reviews of that bike. What’s it like when doing a tight turn? I test rode a workcycles secret service and found that in tight turns my knees hit the handle bars. Is this normal for this style of bicycle? That together with being unsure about what size of frame to order put me off ordering. That sounds like the saddle was too high on the bike you rode, or the handlebars were pointing down a fraction too much (or both). I know this because I actually had the same problem as you, with my knees hitting the bars when I initially got my Oma. It turns out that I was setting the saddle much too high (as well as the bars pointing down a bit too much). I was still of a mindset that the saddle should be at the ‘optimum’ height for pedalling efficiency, when really it should be at a much lower and more comfortable height – low enough for my feet to rest on the ground while I sit stationary in the saddle. The ‘natural’ riding position on these bikes is very different from the bikes I had been used to – much more comfortable, almost like riding a sofa! I’ve lowered the saddle a lot, and raised the bars a fraction, over the past year. There certainly shouldn’t be any need for the bars to interfere with your body while turning. My bars now clear my knees very comfortably. (I should add, however, that this *is* a big bike, so while turns are easy, your turning circle will never be super-tight). It looks like the handlebars are set too low. 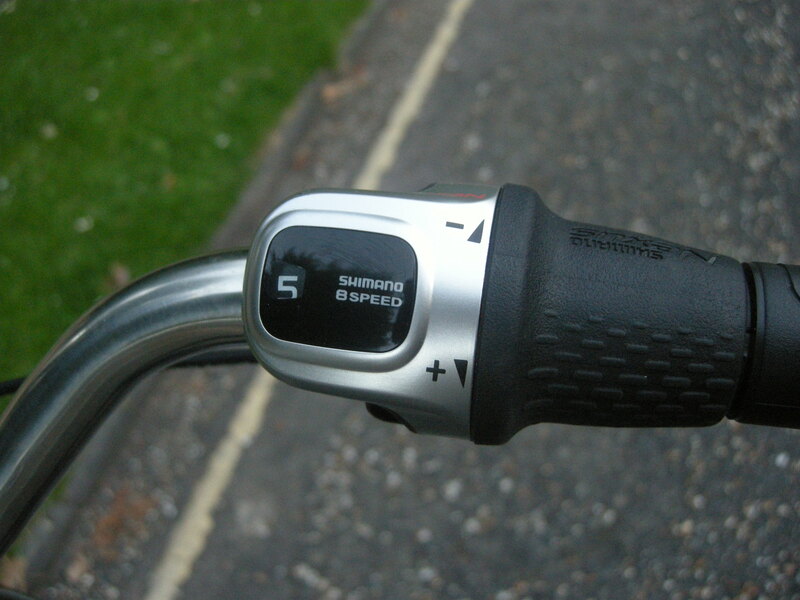 How about this: http://www.fietsenpagina.nl/images/P/Zwart.jpg This is how most people here set handlebars for an omafiets. Ah, yes, the ladies’ version is always a bit more extreme than the men’s version. Are you sure you got the frame size large enough? The way the handlebars are set, omafietsen are known to hit the stomach in a very tight turn, like when turning sharply from standstill. But as far as I know, they never hit the knees, unless the bike is way too small. And saddle height: one should be able to stretch the leg, with the knee with only a slight bend, not entirely straight, while pedaling with the front part of the foot, not the middle part. Lots of people prefer to set the saddle lower, though, as it’s easier to put one foot down while in the saddle during stops. That takes a lot more strain on the knees. Usually the saddle is set quite a bit back, giving more power to pedal, like in recumbents. We did try raising the handlebars to the max. However we didn’t adjust the handlebar angle or seat height. I’ll try emailing workcycles to get their input. Thanks. Interesting post and comments. My own bike is a mongrel – it started as a normal hybrid with a rack and mudguards, but has gradually morphed to include a centre stand, steering stabiliser, hub gears, full dynamo lighting, swept back handlebars for upright riding, leather saddle and bullet proof tyres, all of which I now regard as essential to a bike for everyday use. Next upgrade is likely to be a rear crate to replace my panniers. My next bike will definitely be an upright roadster of some sort. When it came to a new bike for my other half, we didn’t mess about and she’s now the proud owner of a 5 speed Pashley Sonnet Bliss, a beautiful bike. It’s interesting that UK bike retailers are starting to stock more upright fully equipped bikes. My local bike shop tentatively started stocking Pashleys a couple of years ago, and were pleasantly surprised by the number they sold, and we’re not a particularly cycle oriented town. Decathlon do an interesting range of European style bikes these days (B’Twin brand) and the Cycle magazine from CTC recently gave the B’Twin Elops 5 a decent review. Hopefully us Brits are coming to once more appreciate this type of bike for everyday use. And congratulations on your Oma purchase. I too am a huge WorkCycles fan, having been the happy owner of a Double Tube Transport for almost four years now. So much so in fact that I’ve talked my girlfriend into seriously considering the purchase of an Oma. She’s actually ready to buy one now, but I thought it’d be worth her trying an Oma first briefly before making such a large outlay (she did try a standard, non-heavy duty Azor Oma but it’s not quite the same). As I see you have one, in her size (57cm) and not far from London where we live, I was wondering if we might be able to pop up to Horsham one day soon so she could give yours a spin. Would that be possible? Hopefully you can see my email address by virtue of me posting on your blog, but let me know if not and I’ll post a bot-proof version here. That should be fine – let me know when you can make it down. I can meet you in the Park, which is just across the road from the station. I’ll email you! Looks like a great bike. Do you know if the frame is a generic one that’s used by other manufacturers? I’m considering buying a Dutchie Chic and frame looks identical to your Workcycle’s Omafiets. Ditto for a couple in Azor’s range and I think also some in Batavus’s. I also agree about the step-through frames as well! Cocking one’s leg is for dogs, don’t you know? I think you’re right that the basic frame does come from Azor. My bike certainly does have an ‘Azor’ badge on the rear mudguard. 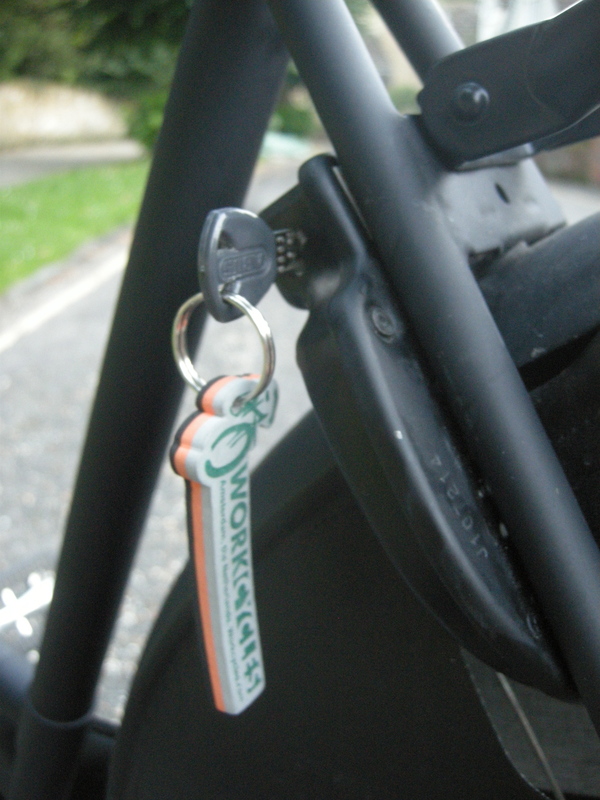 It might be worth asking Workcycles themselves – they’re helpful! what a bike….! !…I have a Land Rover Tremal 20 city bike…..but not very happy on it….I do not like junctions…I do not feel safe moving off…so only used it 4 times……wish I had a step thru instead !!!!!!! perhaps I could trade mine in ??? ?..any ideas where I could do this ? ?….I am in Nottinghamshire..thanks…again…a lovely bike !!!! These Dutch bikes are the way forward. My wife was not at all keen on cycling, because she’d been hoodwinked into riding a mountain bike! Now she has a Dutch roadster and she can’t ride it enough. I bought a 70cm framed Gazelle Primeur T7 in 2011. It is the easiest, most comfortable riding bicycle I’ve ever ridden. So far I’ve done nothing but occasionally pump the tyres up. I was once told that the average Dutch rider expects to buy a new bike, use it 7 days a week, keep it outside all year round and not have to repair it for at least 10 years! That’s why the good quality Dutch makers like Gazelle, Batavus and Azor produce such high quality machines. I use mine every day, for about 15 months I used it for a 24 mile round trip commute. It is huge, weighs a ton and can carry a lot of stuff on the super strength rear rack. I love it and having had it made specially for me, I’ll not be parting company with it. I did wonder about being buried with it in the end, but It’s so big I’d have to buy a double plot at the cemetery! Thanks for this very informative post. It was a influence in getting a Azor built Omafiets, which I only have a few weeks now. It’s in a completely different league to the 20 plus year old hybrid that I was trying to use up to now. It’s brilliant having a bike ready to go with everything already there, eliminating the near OCD preparation of before. I do not regret choosing the drop frame so far. It really comes into its own when travelling with fully loaded massive Willex panniers and front crate, just being able to put both feet down comfortably at stops when required makes so much sense. The shop suggested that I nearly have a cargo bike. I couldn’t really have justified a bakfiets on practical or logistic grounds, but this omafiets is the business. Shopping now is no longer restricted by choosing items that are not too heavy to prevent breaking more spokes or are too bulky for standard panniers. Such bikes are becoming a slightly less rare sight in Dublin these days, as people are discovering their sheer convenience and practicality, which is aided a lot by a small number of specialist shops leading the way in making these wonderful machines available. I wanted a replacement for my 30 year old Raleigh superbe which has seen better days. I went into the local Pashley dealer and expressed an interest in a Pashley Princess classic, the three speed version. The dealer tried to sway me toward the male version, which I was not keen on so I paid a visit to a dealer in Stratford on Avon which hires out Pashleys. I always liked the swept back north road handlebars on my raleigh and this is what attracted me to the Pashley and dutch bikes. I really love the riding position and I took a princess classic for a test. I found it very comfortable and solid in every way. It was lighter and more responsive than my old Raleigh which weighs 42 pounds, the Pashley Princess classic weighed 31 pounds. Added to which the tyres are a narrower profile and the gearing is lower on the Pashley . I actually used 3rd gear on the Pashley. I think the Princess sovereign, the 5 speed version is heavier, more akin to the weight of my Raleigh. and I have ridden three speed classic roadsters all my life. Even a moulton and I got some comments about that when I was younger. I ordered a regency green princess classic in a 22.5 inc frame and I took delivery of it three days ago. I can’t stop riding it and I took some time adjusting the saddle, the handlebars and I reversed the position of the saddle clamp to behind the seatpost. They leave the factory in with the clamp in front of the seatpost. 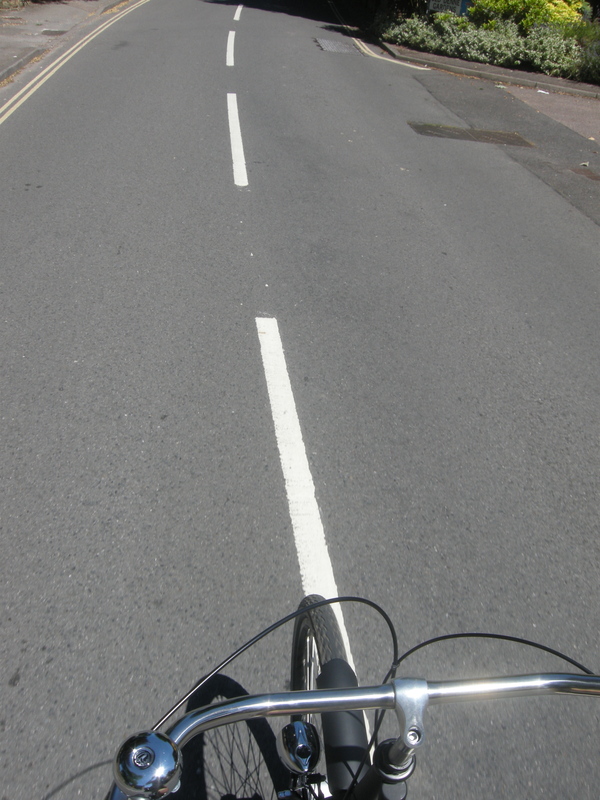 The result, a lovely upright riding position with my arms straight so I can pull on the handlebars when hill climbing. I manage to get her up most hills and slopes in 1st gear and I haven’t got off and walked yet! I’m finding the hills I struggled with on my Raleigh, I can get up relatively easily on my Pashley. The downside is I will not be leaving my princess locked unattended in any public places and I will use my Raleigh for errands. I did consider a dutch bike however I am quite a distance from dealers who sell them and I certainly wanted a test ride before I purchased. I am more convinced by this article. Thanks for an interesting and very informative article. Sorry I’m late. Just discovered the site! How do you stop the front wheel from being stolen? It’s only held on by two flat sided nuts. If it was a quick release axle you could use all sorts of axle locks. Missing front wheels are a problem around here! 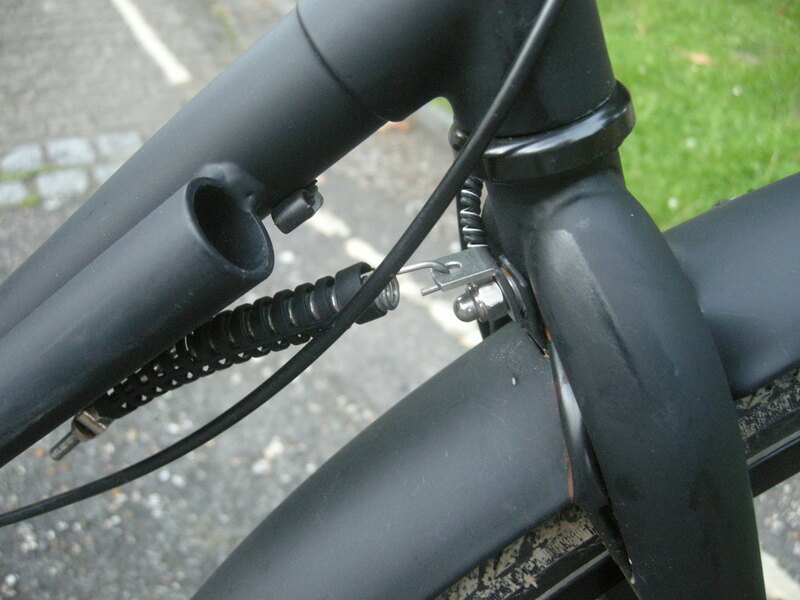 An AXA Plug-in Cable click-fits into the fixed lock and, if long enough, can lock your front wheel and the rest of the bike to a post, etc. Make sure you get the right thickness to match your lock. It could be an issue, but in practice it’s probably quite difficult to get the wheel out once you’ve undone the nuts; detaching the front (drum) brake is pretty fiddly. Hello, I have just bought a dutch bike from a uk company as I love riding these upright bikes while abroad. I have chosen the smallest frame at 50 cm as I only have short legs, 28in, and here lies my problem. If I have the seat high enough for my legs to feel comfortable peddling, slight bend in leg when extended, I have put the handle bars higher but now I feel I’m not in control of the bike as I feel so high from the ground I can’t touch the ground at all even on tiptoe. Any advise out there on how to set this up correctly also, and this may be a stupid question, would swapping the wheels for a smaller version be an advantage if at all possible? I have risen bikes all my life but this is the first dutch style bike I have had. With this kind of bike you should really set the saddle height so at least one of your feet is comfortably on the ground when you stop. That’s more important than having a fully extended leg when pedalling. 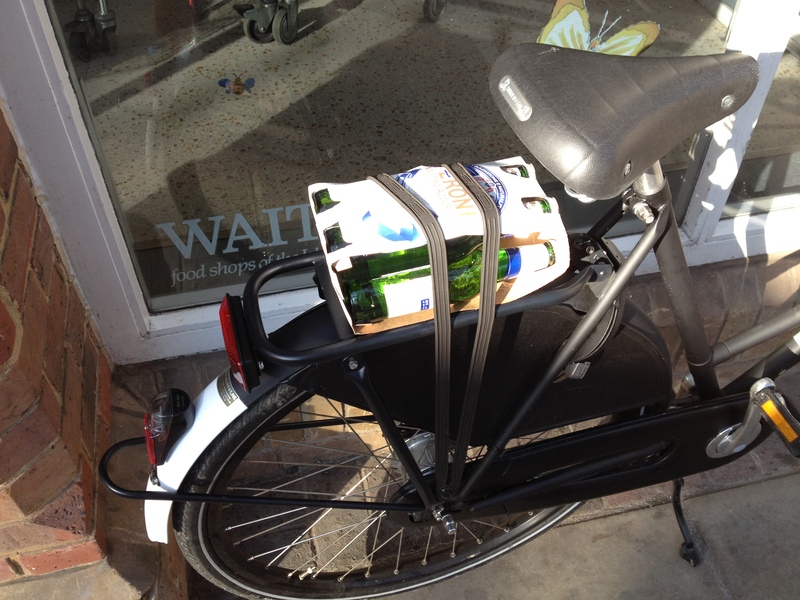 This is how I’ve set up my Dutch bike. If you lower the saddle to a ‘safe’ height and you are actually having difficulty pedalling, then the bicycle might be too large for you (although a 50cm frame sounds about right). 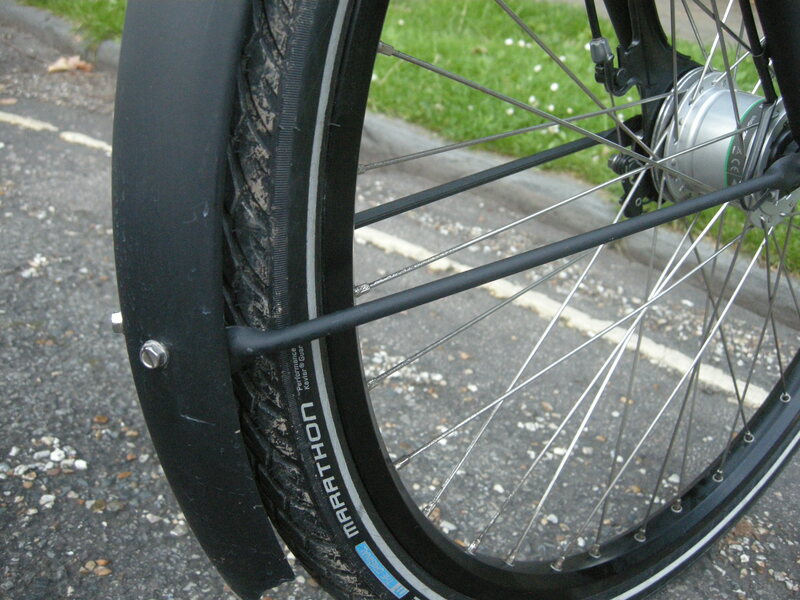 I doubt you will be able to change your wheels – a bicycle frame is designed to take a specific wheel size. Usually this will either be a smaller 26 inch wheel, or a larger 29 inch. Setting your seat so low you can put a foot on the ground whilst remaining seated is an acceptable strategy to get used to this type of bike. It is not advisable in the long run though, as being able to (nearly) stretch your leg while pedalling is much more comfortable, is kinder on the knees and makes it much easier to cycle into headwinds like in the open Dutch countryside or up the hills like here in Wales. Many of my customers initially felt ‘too high of the ground’ as well but once they got used to their bike they raised their seat, a little bit at the time (it is amazing how much difference half an inch makes!) and ended up with the nearly-stretched-leg position the Dutch themselves use. The standard way to find this position is to set the seat at a height whereby your leg is fully stretched with the middle of your foot on the pedal in the lowest position. As you cycle you will use the front of your feet on the pedals, thereby not quite stretching you legs fully when pedalling. 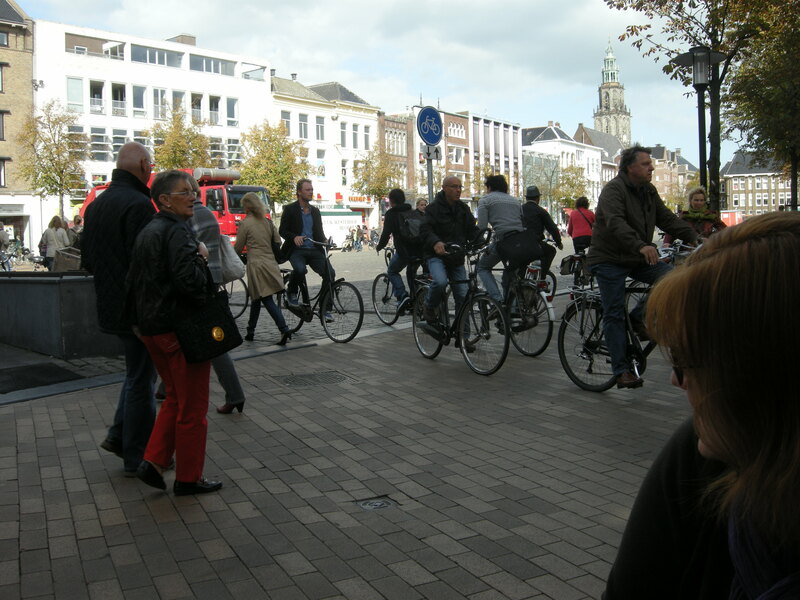 When stopping the Dutch usually get off their seat (unless there is a handy kerb nearby!) or lean a little sideways. When starting off they step on a pedal before sitting down rather than the other way around. Don’t worry, these are habits you will quickly get used to and before long you will feel in complete control of your bike. Happy cycling! On another note: I think any UK supplier of Dutch bikes should be celebrated and mentioned with their full name and details! Hi, thank you for your article. I have been riding my husband’s Union Omafiets for 5 years on almost daily basis. My bike is my car. I have the largest frame size 57 (? ), although I am only slight female 160cm. Got used the size by now. It works well in hilly North Yorkshire and it takes me on regular challenging trips. It now requires some parts though like the mudguards because they rusted through. Salty seaside air :), despite of being kept in a garage. I wonder if you could help me please… Do you know about spare parts available in England? Apart from that bike works without reservations and I absolutely love it. Will never have anything but Omafiets. Dutch bike spares etc. are a little hard to find in the UK – personally I use David Hembrow for accessories. He might be able to help you with what you’re looking for! Hi. I just got a new Oma and love it! Can you suggest the best way to lock up the Oma in a dense urban area with a lot of bike theft? I know the rear wheel locks but what is the best way to lock up the front wheel and frame? Thanks. I’d suggest using a decent U-lock, or chain lock. A longer-term measure that I have used is switching the wheel lock for an AXA one that has a plug in chain. Loop the chain around whatever you want to look to, plug it in to the wheel lock, and then take the key, as normal. The wheel is locked, and the bike is chained to something, all with just one key. Are lighter AXA locks available? I have one that came with the bike and I leave it in my parking at work cuz its so heavy. Would like something for day trips around the city on weekend.s Thank You. Not really – it’s heavy for a reason! If it’s light it will be easier to cut through. http://cyclinginedmontonfromtheeyesofateen.blogspot.ca/2016/03/my-new-omafiets.html I’ve only owned my own omafiets for a few hours and already I love it. For just ~600 dollars too! requires that certain not make more assumptions than necessary. barbers However, certain models of electric razors can easily be used inside the shower. 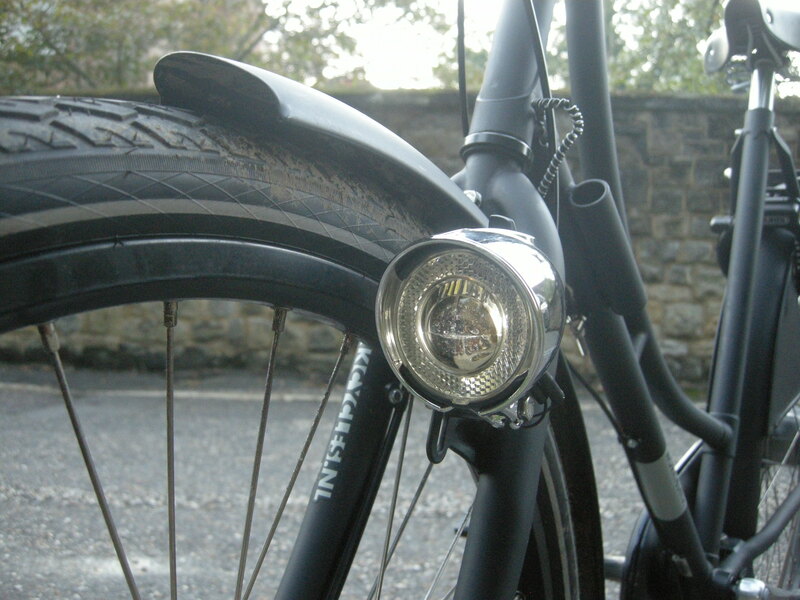 I realize this post is old – but I would be ever so grateful if you could share a close up of how you mounted your light to the fork. I cannot figure it out on my own. Thank you ever so much. The fork itself has a mount welded onto it – the light itself is simply bolted (with a horizontal bolt) onto that mount. You can see the mount pretty clearly in this photo (click to zoom in) – it’s the same colour as the fork, but sticks forward from it. https://aseasyasridingabike.files.wordpress.com/2012/07/dscn9683.jpg It’s essentially just part of the fork. I’m not sure how you would attach an equivalent light without this mount – sorry if that’s not much help! I’m fairly certain that bracket is originally intended for mounting a bottle dynamo if you don’t have a hub dynamo. 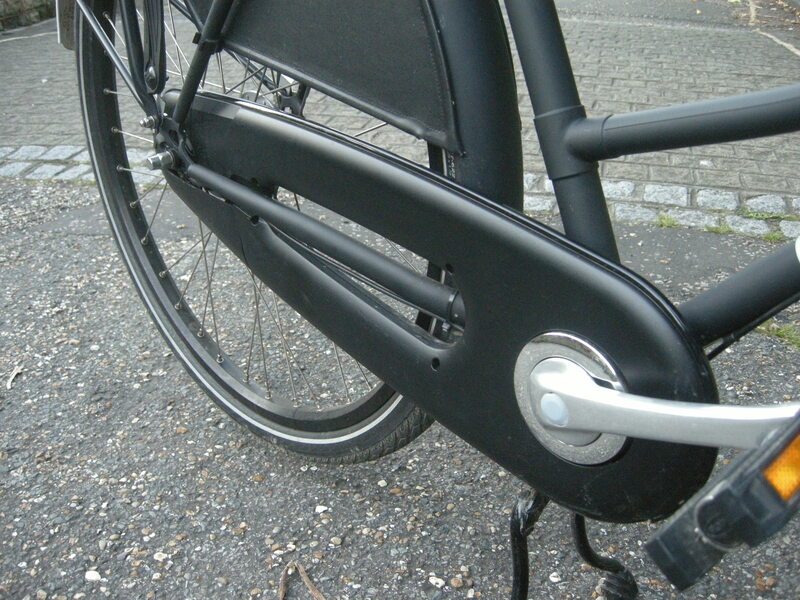 On Dutch omafietsen—and the English roadsters on which they are based—it’s common for the headlamp to be at the top of the headset attached to a stamped sheet metal bracket made for that purpose with the wiring passing up a series of holes and grommets inside the steerer tube and stem. Not much use if you have a basket up there, though… On mine, I used to use that left fork bracket for the odometer, but now use it to fix my hub dynamo powered AA battery charger (and the odometer now uses the headlamp wiring route) :-). You are welcome to my original headset bracket [for 25.4 mm OD steerer] if you want it… Aseasyasriding can pass on my e-mail address in private. 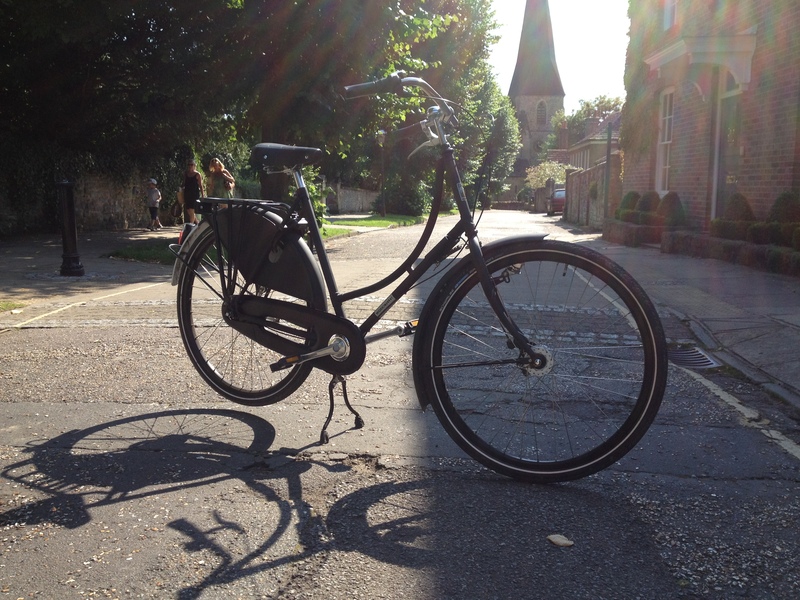 Nice article….just bought a gazelle tour populair after previously owning a dutchie which got stolen. In between the two i bought a cheap runaround which was more mountain bike style, but i insisted on a rear coaster brake..wouldnt be without one now and dont understand why they are not more popular as they give much easier and organic braking. So glad to be back on a dutch bike now though, upright with greater visibility and feel so much safer cycling on the roads. My only gripe is the front light issue. On my dutchie the front light was mounted low and attached to the front mudguard, which was great as allowed room for front basket without interfering with the light. On the gazelle the light is mounted much higher up, and i cant have a basket without resorting to moving the light to the front fork as you have done, but im hesitant to do so at the moment, so think will just invest in some good sized rear panniers to resolve the problem. If you still have your omafiets, will you please take a close-up picture of where the front light is mounted? The headlamp recently fell off my WorkCycle omafiets, along with the parts that were holding it on, so I’m not sure what hardware has gone missing. If only I could see one with all the mounting hardware… By the way, I love all the close-ups you took of the various bike parts above. The spring also fell off my bike, and I now see I need a black coil sheath thing (like on your bike) that fell off and got lost. Thank you! hi, i recently bought a secondhand workcycles oma, love her but need panniers! what size clarijs do you have on your oma? trying to decide between the L and XL but worried about the overhang? 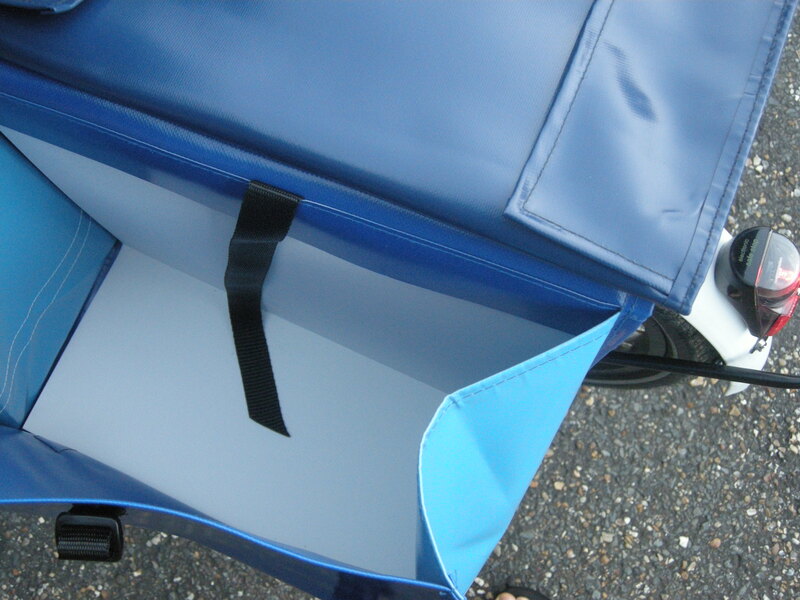 please let me know about your experience with using your clarijs panniers. 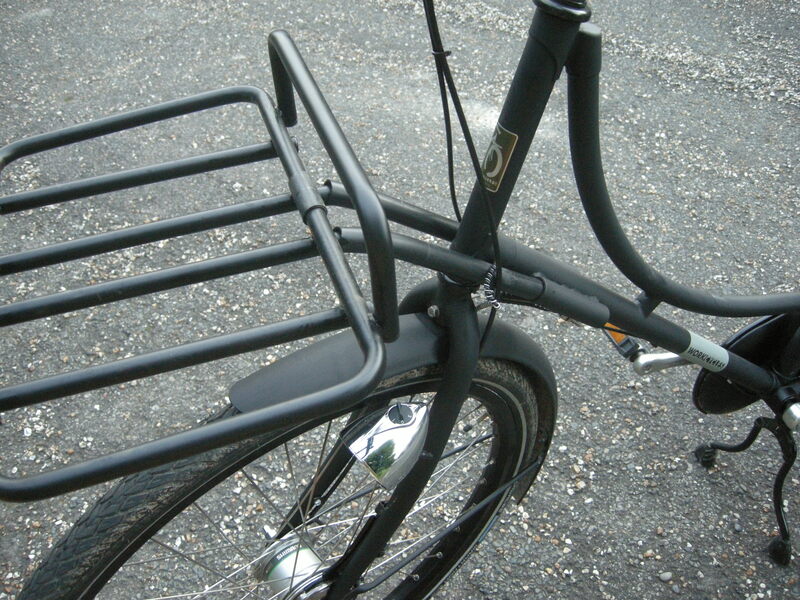 I have black Clarijs XL planniers on my Azor opafiets with an identical rear rack as the one on the Workcycles oma. Works perfectly. Hi. I was wondering how difficult it was to swap the headlight with your Lumotec. I’d like to do the same. Just need to know the difficulty level! If you don’t mind what is your inside leg measurement? Mine is 90cm I’ve gone on websites that say I should go for 57cm and others that say 59 even 60 so i’m confused. Also how much does this bike cost in the U.K? I’m torn between this and the Gazelle Oma.